According to the Better Business Bureau BASTA has a D- rating achieving a composite score of 2.54 out of 5.0.The BBB’s Website is very clear: BASTA is not BBB Accredited! The BBB Composite Score is Comprised of 67% BBB Rating and 33% Customer Review Rating. The BBB Customer Review Rating represents the customer’s opinion of the business. The Customer Review Rating percentages are based on the total number of positive, neutral, and negative reviews posted. The BBB letter grade represents the BBB’s opinion of how the business is likely to interact with its customers. The BBB Customer Review Rating plus the BBB Rating is not a guarantee of a business’ reliability or performance. BBB recommends that consumers consider a business’ BBB Rating and Customer Review Rating in addition to all other available information about the business. More recently Daniel Bramzon, the founder of BASTA was accused of having ties and a business relationship with a notorious landlord, Jeff Byrd, by the Los Angeles Tenants Union in a Los Angeles Weekly Article written by Hillel Aron on June 23, 2017. In that article Mr. Bramzon was accused of a blatant conflict of interest and a march on BASTA’S Los Angeles Office was organized by Tenant’s Activist Trinidad Ruiz. In fact, the LA Weekly reported in that same article that in a lawsuit filed last year by tenant Marina Molina alleged that Byrd returned rent checks, falsely claiming they were late. The suit named former BASTA attorney Jon Gelb as a co-defendant and alleges he was business partners with Byrd. And who is the attorney who represented the defendants in the case? Daniel Bramzon. At least he was until last week, when he removed himself as attorney — the day after the Tenants Union showed up to his offices. A simple Google search of Daniel Bramzon’s name reveals these articles and others. Robin Hood never had it so good. BASTA. according to GuideStar which tracks non-profit organization’s financial records reported Gross Earnings for 2017 of $2,325,309.00 and total assets of $1,463.247.00. Most of BASTA’s income is derived off the backs of the indigent tenant it represents as BASTA reportedly takes as much of 50% from every settlement it obtains from Landlords to pay off a recalcitrant tenant. How much of BASTA’s earnings have gone back to the tenant community Daniel Bramzon claims to defend? So how does BASTA do so well? It is called litigation by intimidation. BASTA claims that it demands a jury trial in every eviction case it handles. This is a true statement as far as it goes. What BASTA and Daniel Bramzon does not tell you is that it does not win every jury trial. In fact, landlord law firms have had great success in defeating BASTA in jury trials. 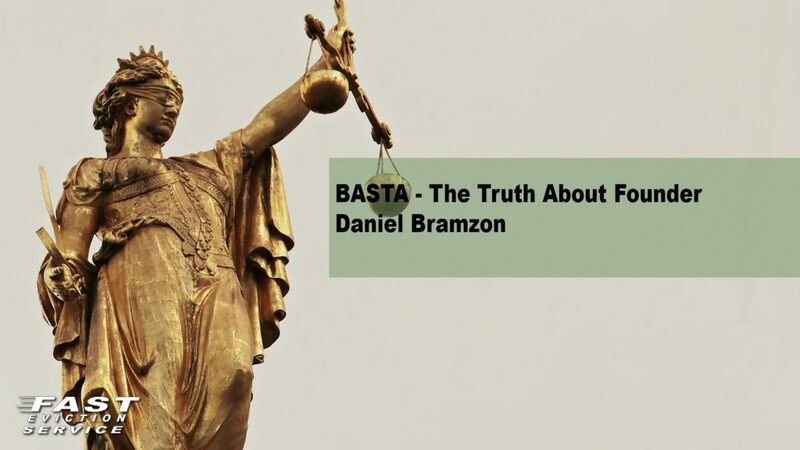 BASTA and Daniel Bramzon also will not tell you how many jury trials that they are involved in actually go to verdict or a decision by the jury. BASTA will also use numerous delay tactics to force the landlord into paying more money in attorney fees to the landlord’s attorney by BASTA’s attorney announcing ready for trial and then when the case is sent to a trial courtroom the trial attorney magically disappears for the afternoon. So how do you defeat BASTA in every Unlawful Detainer case? First, be prepared before you get to trial. Have a tenant file that is replete with good solid information about the tenant and the history of the tenancy, e.g. a strong rental application with solid information about references. Second, always require your attorney to conduct discovery on the tenant’s allegations in the answer. Many times, BASTA will be unable to provide even the basic information to support the tenant’s defenses. Third, do not shy away from forcing BASTA to put up or shut up by being prepared to go to trial on the FIRST DAY OF TRIAL. Fourth, do not get intimidated by BASTA’s aggressive litigation tactics. Fifth, turn BASTA’s phone message “If the Landlord wants a fight we will give them a fight” against them. Don’t shy away from a fight. Finally, make sure that if BASTA is defending the case that you have hired an experienced law firm, like H. G. Long & Associates, to represent you. H. G. Long & Associates has a long history of litigating jury cases against BASTA and its success rate against BASTA in unparallel. H. G. Long & Associates does not claim to be fighting for Social Justice and to benefit economically by fighting for Social Justice. H. G. Long & Associates simply claims to provide the most efficient and economical method of getting the right and just result for its clients.